As I have been saying recently my skin seems to be on the fritz. It was kind to me in my teenage years and remained pretty spot free. It has always been uneven but that I could handle. Nowadays it is a totally different story, in the past couple of months I have been a mass of spots and oil and it is driving me mad! It really annoys me that half way through the day at work I will look in the mirror and all my makeup has slipped clear off my face and left me with a delightful glistening sheen of oil. HURRAH! So I am now on a mission to change my skin care routine to suit oily skin in the hope of clearing it up, in turn clearing up the spots ( as I mercilessly pick at, leaving scars!) Any one else on the oily side of life and with any hints!? Formulated to be part of a daily skin care regime to help maintain youthful looking skin for a shine-free finish. 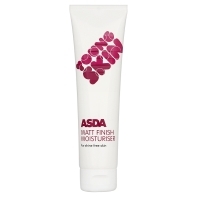 This matt finish moisturiser contains Aloe Vera, Willow and Papaya Natural Extract. Helps purify skin and soothes redness. Designed for teenage skin ( thanks for body, you have always been a little slow on the uptake!) I was not expecting much but I have been really pleasantly surprised.It is not too thick and paste like, goes on smoothly and easily while still injects a good bit of moisture but quickly drying matt. It doesn't cake up or dry too matt that applying makeup on top is difficult, it just leaves a good smooth base. I have been using it for the past few days and so far it holds up well for the my 8 hour working day and then if I am going anywhere in the evening all I do is re apply and top up my foundation on top. I would definitely recommend this to anyone in a similar pickle, I am keen to still try out other things but for this price I will be keeping a tube of this in my handbag at all times for sudden disastrous slicks. I knew my teenage skin was too good to be true!